Real knowledge for REAL BRIDES! ​The spot for brides to find and discuss everything weddings! Current Wedding trends + 2 bonus $$$ saving tips! So what's hot in 2018 you ask?? Whether you love to follow trends or try to steer well clear of them, here are the details you need to know! Nudes, peach shades, blush pinks and whites. 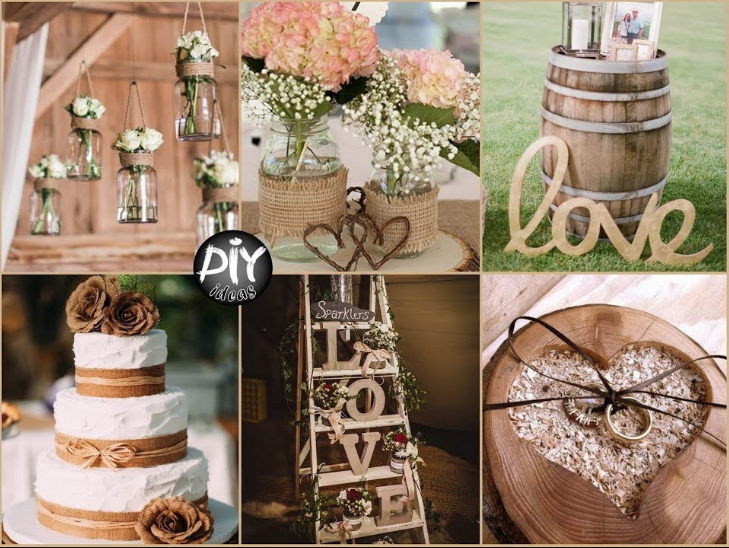 Brides are going very earthy with rustic styling and boho themes. Relaxed, semi vintage events are SOOOO IN! Add a splash of rose gold or copper and you're on your way to a very ritzy looking event! To save some cash on your venue decorations, why not upcycle some old vases or candelabra with a splash of paint! Places like Bunnings sell a fantastic variety of colours, making it easy to spray new life into old items. Ask friends or family if they have any old bits and pieces they no longer display as mismatched vases are totally in right now and provide a real rustic/vintage look on the cheap!! Even washed jam and sauce jars and even cans can be transformed into masterpieces! Modern couples are now opting for outdoor ceremonies so an arbour or arch is an absolute must! 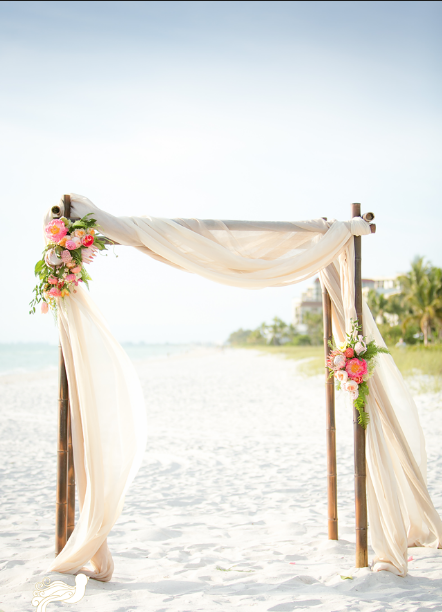 Whether you choose a beach or a garden venue to say your vows, an arbour is the perfect finishing touch. They look brilliant on photo's, framing you and your brand new husband especially when adorned with flowers and some sheer curtain tied off to the side. Accent colours that have made a huge impact in the wedding industry recently are navy blue and burgandy tones for that moody, romantic flair. ​Another great money saving idea is to re use your ceremony decorations inside your reception venue! Usually the flower arrangements that have done their job beautifying your arbour can be removed and repurposed as decoration for your head table or the cake/gift table. Bunches used to line your aisle on chairs can be popped in the mason jars you upcycled earlier! Leave us some more fantastic money saving tips you have come up with in the comments section, we'd love to hear what you have planned!! 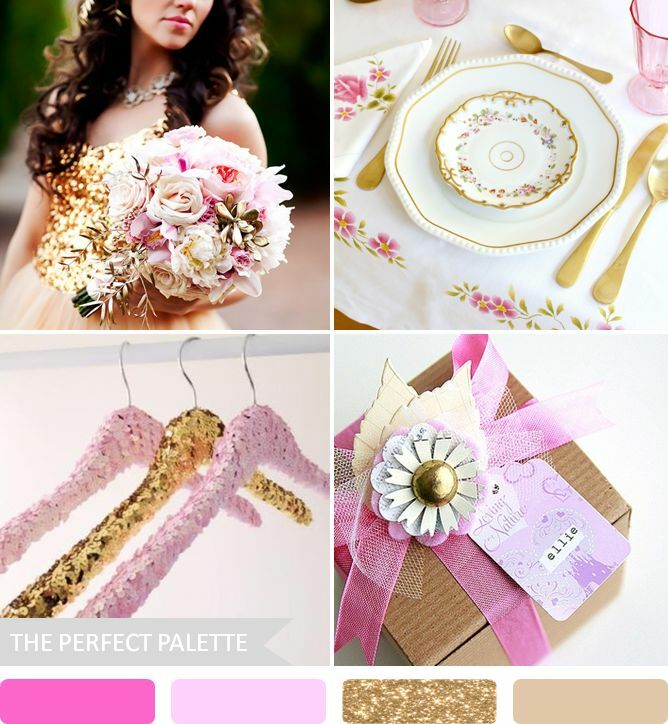 This week we are plunging head first into the top 10 trending colour palettes for wedding right now! If you are undecided or maybe just need to convince the other half, then keep reading!! 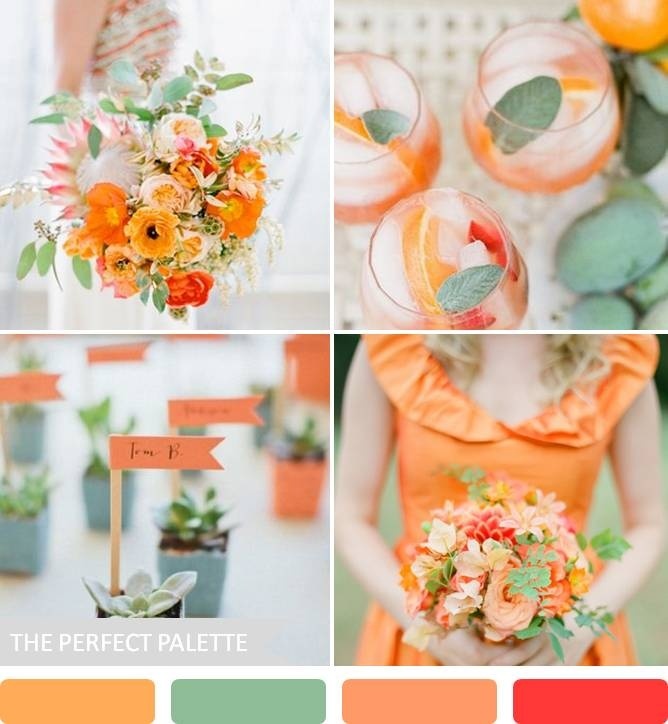 Colour really is one of the most important elements of your entire wedding. it will set the mood and feel for your day right from the moment your guests open their invitation. We have listed ten of the most popular and gorgeous colour combinations, fit for the most glamorous of events! There are no rules, so throw caution to the wind, be brave and just imagine the possibilities..
What happens when emerald is paired with lovely shades of aqua and turquoise? Something pretty spectacular. This combination would cool your warm weather wedding and could easily lend itself to a winter event too. With such versatile and calming tones, this cool collection is definately a fave! This beautifully blended palette is awash with serenity! Such a breath of fresh air and perfectly suited to an Spring or even Autumn wedding. The vibrant orange hues paired with the subtle dusty green is a match made in heaven. 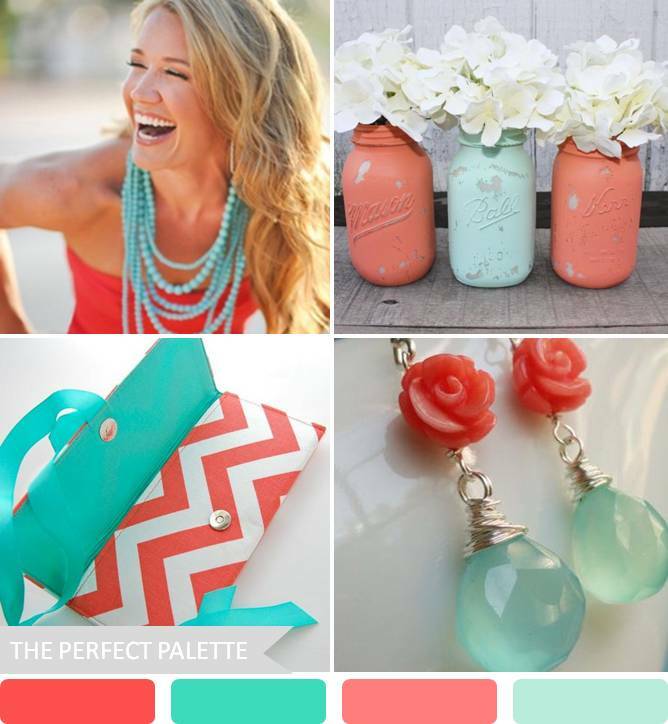 The splash of watermelon/coral is like the cherry on top! We are absolutely smitten with the colour lavender and it's no secret that millions of you are as well! But have you ever considered pairing it with shades of mint and plum? I just love how these colors come across as soft and airy. But it's also great how you can increase the intensity here and there by adding a pop of deeper colour to give it a rich and dramatic edge. Next up we have one of my all time favorite pairings. Sweet, playful and definitely fun-filled, this happy palette just makes you want to smile. 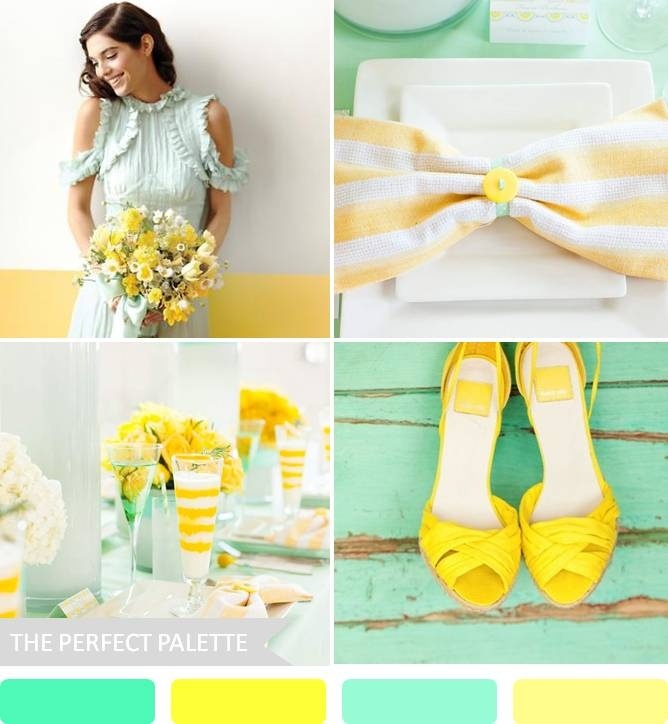 Absolutely unique and far from being boring, this pretty palette can be done in very muted shades or with yellow as bright as the sun! There are no rules so why not be bold. 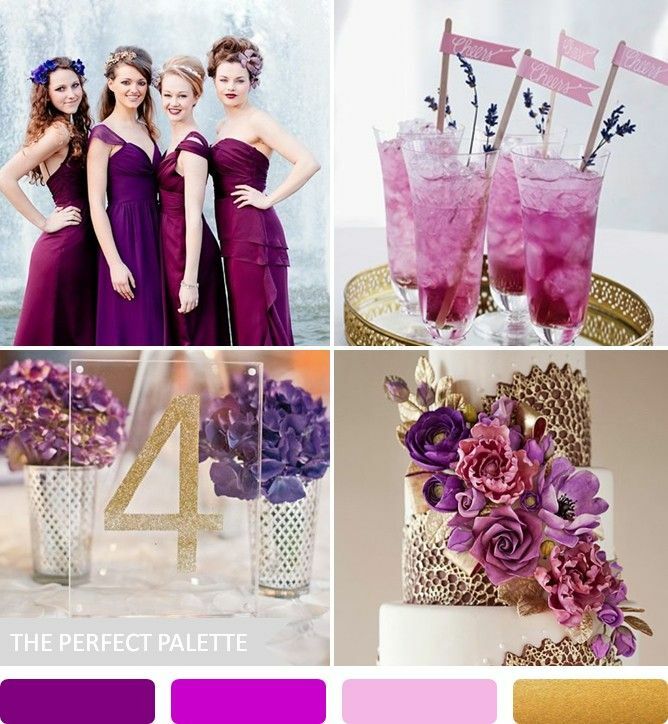 Any colours from the pink or purple family are among the most popular colours used in wedding theming. Mix in some fabulous metallics like this glittery gold shade and you're on your way to hollywood baby! You can really glitz it up or easily give it a modern edge or swing it towards a more vintage style. Gold has a way of coming across as elegant and chic. 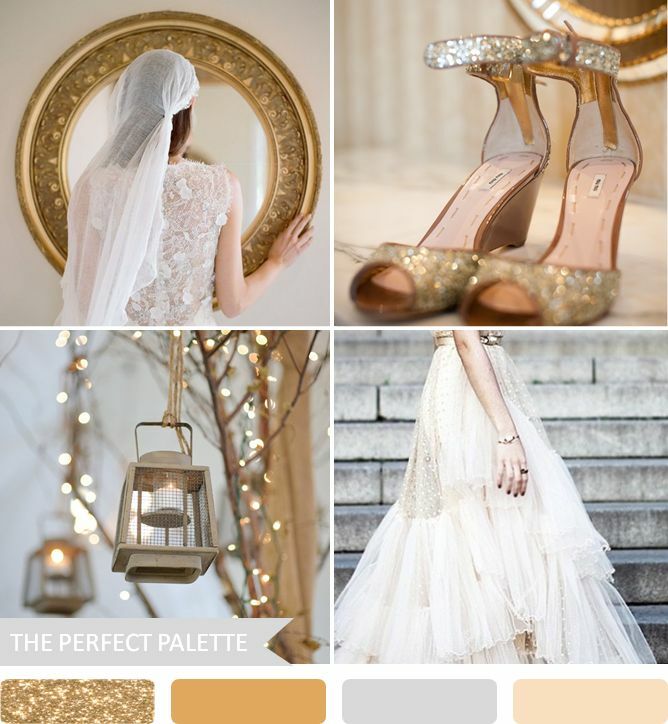 And when it comes to selecting your wedding colours, there's always some room for a touch of sparkle whether it be in gold or shimmering silver. There is something about little bling that just shouts 'special' and every bride wants to feel like a jewelled "Glitterella' queen on her big day right! Bright, bold and oh so beautiful, this is the sort of palette that grabs my attention and inspires me to think creatively. It's a bit unique and definitely a whole lot of fun. Definately brings out the summer spirit and would look fantastic at a relaxed beach wedding. Let's face it, these wedding colors aren't your grandma's wedding colors. They're surely a scheme dreamed up by a new generation. Couples who love to embrace uniqueness flock to colors like these. And it's easy to see why! If you're looking to add a healthy dose of whimsy and fun to your day, then you might consider something fun & festive like this! Our obsession with sparkles continues with this special sequined delight! The feminine pale pink accompanied by very neutral earthy tones is just so dreamy. Let's face it... everything is better with bling! Tranquil yet full of excitement this combo is ever popular. These shades never seem to go out of fashion and for a very obvious reason... they are amazing! With white as the base, royal blue and aqua simply pop with a crisp and stunning affect not easily forgotten. 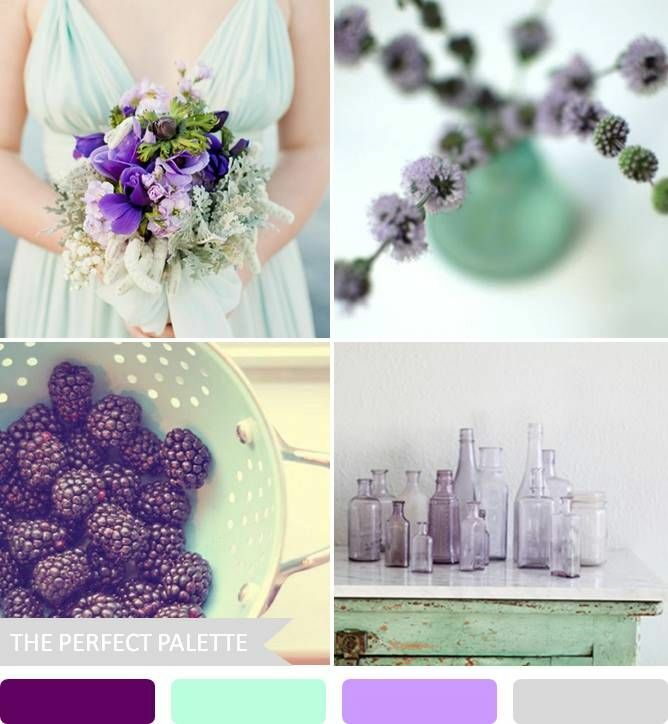 Our top 10 fab wedding colour palettes. But don't stop here. There is a world of endless possibilities out there just waiting for YOU to discover them! Never be afraid to let your personality shine on your wedding day. If your outgoing and fun, the allow your theme colours to reflect that. If you are more timid and shy then go ahead and rock that too! Trust me... you got this! 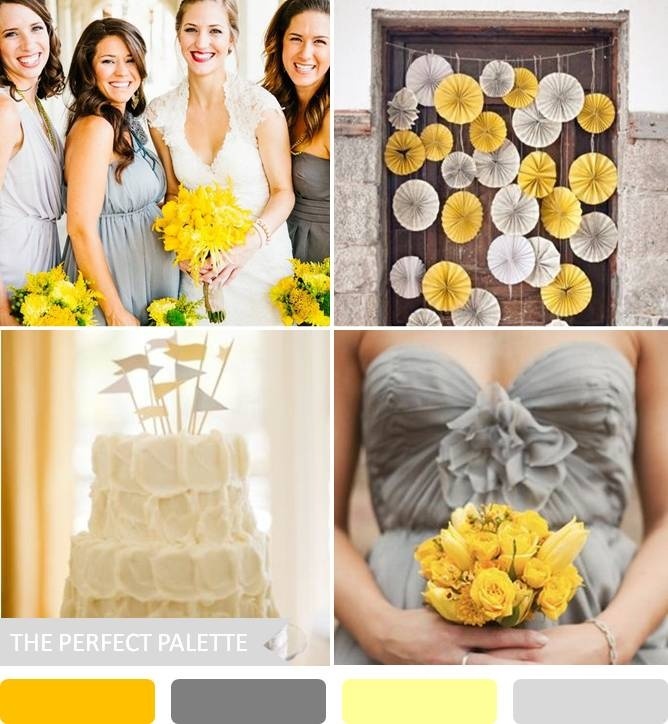 ​Leave us a comment below on your preferred theme colours, we would LOVE to hear from you. So what is bridal brain? If you are experiencing these day dreamlike symptoms then YOU are suffering from BRIDAL BRAIN! It's the staying up all night, googling which shade of white would be best for your reception table cloths (and let's face it, there are way more than you ever thought right!). It's the reoccuring debate over open-toe, closed-toe or flats. ​It's the flipping through magazines to find that perfect venue til your fingers bleed! Often, you don't even realise the impact that all this wedding stuff is having on you until you are well and truly frazzled. Wedding planning can be all consuming but it doesn't have to be stressful or overwhelming. If you know where to look for inspiration, information and advice, you will save yourself countless hours of research. We are bringing you this blog to pump the fun and excitement back into planning your wedding, while providing you with more info and tips than you even knew you needed. To find out more on these topics, you will have to set your alarm to come get your 'fix' every Wedding Wednesday! If you have a burning question that you want us to find the answer to, or a product that you want reviewed, leave a comment below and we'll get right to it! ​It's unwritten law that every bride to be simply must have a diary, notebook or folder (some need a suitcase!) to keep track of all the things you will need to organise for your big day. We call this your Bridal Bible. After all, we know it's just a matter of time before the scattered Bridal Brain kicks in! You will use this to keep business cards, flyers, appointments, magazine clippings, colour swatches and any other completely necessary pieces of clutter, I mean inspiration..... that you collect. It'll be like your best friend for the next 6 or more months til your wedding day, I promise! 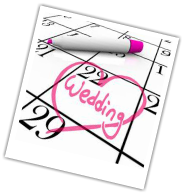 Dedicate sections of your diary or folder to each element of your wedding. For example, a few pages or 1 sleeve will be for cakes, another for venues and so on. That will make it so much easier to find that picture, amongst the many that you wanted to show your mum on the weekend. You should have at least 9 separately dedicated sections to your bridal bible. These are the elements that are going to form the foundations of your wedding day. This is the list of suppliers you will need to hire. There are loads of DIY checklists on the internet and I'll share this Easy Weddings one with you because it's super easy to use. There's also a multitude of mobile phone apps to help you get organised. Now it's time to choose a few suppliers from each category. So google 'wedding cakes' and your area name. pick the top 3 - 5 that catch your eye and contact them for a quote and/or consultation. Remember to pop any details that you write down or print relevant emails to pop in your folder. It may seem a bit old school to have a hard copy but in this case, it is much easier to compare suppliers when you have it all spread out in front of you. All you need to do now is go over your options with hubby (if he's interested! ), or your bridesmaids or mum, and cull the list until you have selected the creme of the crop! Remember to keep in mind the 3 rules when comparing your suppliers. #1 RULE ~ When comparing pricing, ensure you make a fair comparison. The old saying 'you get what you pay for' is often very true, so ensure you price like for like items and services. For example, one photographer may have a $1000 package that includes 400 unedited photos, an album, a canvas print and a DVD with 4 hours of coverage. Photographer number 2 may offer a similar package with 7 hours of coverage for $2000 with edited photos which we all know are way more glamourous. The point is, don't always be swayed by the cheapest option because it may be the cheapest option for a reason! Know exactly what you're getting for your money and make an educated choice on the best option for you and your budget! #2 RULE ~ We all know that most women luuuurve to fuss over weddings and get involved in the planning process. And that's great..... most of the time. If you have your heart set on that mermaid style strapless ivory gown with the beaded bodice, then you go get it girl! Other people's opinion's can make you look at things differently which can often be a good thing, but when you start taking other people's negative opinions on as your own, friction can arise very swiftly! Make sure you lay down the law TO EVERYONE, which topics are up for discussion and the decisions that you are making on your own. Be true to yourself and you'll never go wrong. #3 RULE ~ Ensure that you get on with each supplier you intend to hire. You will be in contact for months before and you will have to deal with some of them during your actual wedding day. You need to feel a level of trust and compatibility with the businesses that you deal with so that any bumps along the road don't inflate into a huge unnecessary drama that may ruin your whole experience. Developing a mutually respectful relationship with your suppliers is the key to a flawless event. Thanks for sticking with us for our first blog post of the series and we're so wrapped to have you! Looking for an inexpensive way to have the gorgeous flowers you want and deserve on your wedding day?